Irresistible? The Brad Pitt of the salad world. We stumble down by torchlight. Past wobbly wooden fences enclosing whispering gardens bright with lettuce, lemons and pumpkins. It’s windy at night by the glacial Ganga. So finally inside the cosy thatched ‘ theatre,’ featuring a stage strung with fading bed sheets, we’re intensely grateful for the offer of steaming honey-lemon-ginger tea. This is Rishikesh’s most charming secret. An endearingly earnest attempt at ‘Supper Theatre’ by Ramana’s Garden, an orphanage run by expatriate turned India-insider Dr. Prabhavati Dwaba. Ramana’s draws support from Rishikesh’s unique blend of international tourist truth seekers, karmic collectors and almost-worryingly bendy yogis by reeling them in with a crafty mix of inspiring eco-warrior theatre, soul-satisfying organic brown rice and wicked amounts of fudge cake. The play, a fiery treatise on how big dams suffocate ‘Ma Ganga’ is irresistibly inspiring thanks to its stars, a bevy of feisty kids unapologetically hamming it up. The orphanage uses the inevitable donations this play prompts to hire lawyers and file PILs against dam construction every year. Then, it’s time for dinner, a triumph of vegetables so vibrant they taste of sunshine, at Ramana’s Garden Gallery Cafe. We file in, soaking up the atmosphere — low wooden tables, haphazard strings of tiny lights, warm brick walls. Glowing with a combination of salad, fresh air and crafty lighting! 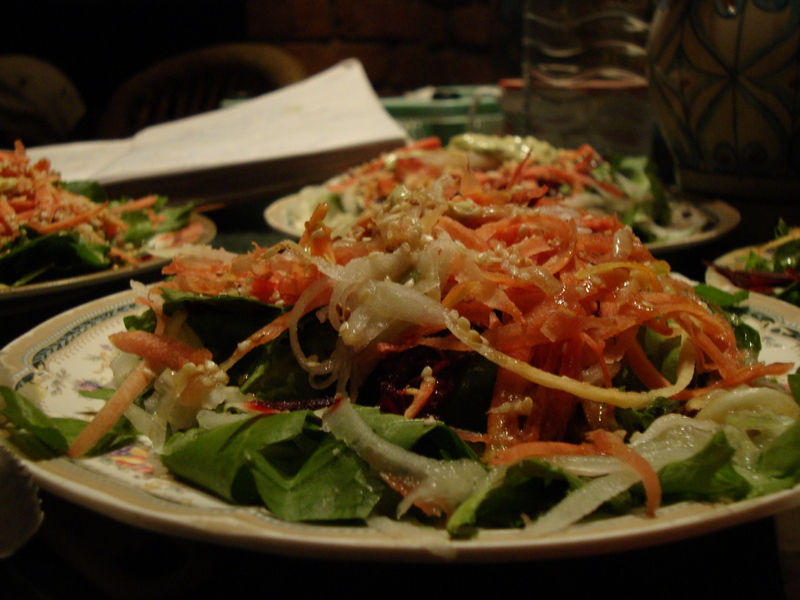 Our meal opens with the Picassos of the salad world: crinkled lettuce, deep green argula piled with delicate carrot sticks and juicy piles of grated beetroot. It’s all topped with a generous dollop of creamy avocado. The sophisticated blend of flavours, texture and colour is fascinating. Especially given the fact that it’s been dreamt up in an unpretentious kitchen, worlds away from the influence of five star chefs, fancy equipment and edgy culinary schools. When Dwaba first came to India 30 years ago (seeking enlightenment in a time-honoured tradition) she says her “guru” told her to live in silence “in a cave for a year”. That’s when she noticed the malnutrition among children. “It was outrageous. It made no sense. If you drop a seed here, you get a vegetable. If you tend it you get ten,” she says, explaining why she began this project. Meanwhile we’re working our way through thick wedges of lasagne, stuffed with lush pumpkin, zucchini and mushrooms, surrounded by buttery tagliatelle and oozing with creamy cheese. 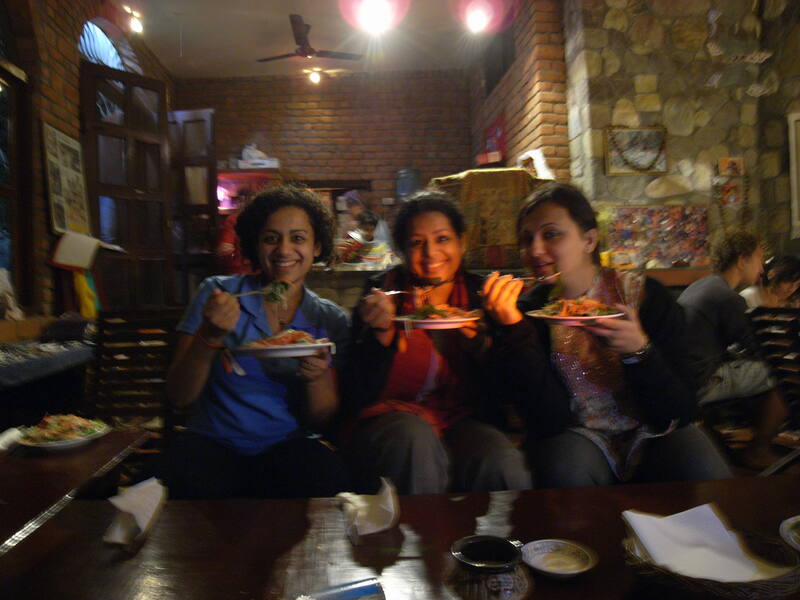 Tonight Ramana’s Café is buzzing, thanks to a flood of guests from the International Yoga Festival at Parmath Ashram. Dwaba adds with a grin, “From tonight we hope to eat for a week!” Her project includes a mountain retreat, where a lot of their produce is grown both for the orphanage and the restaurant. Apples for instance, which can be eaten fresh, in pies or in their popular apple-ginger jam. The seasonal menu incorporates a range of English vegetables, unusual varieties (our salad for instance includes four kind of lettuce) and innovative ideas, though the food is unfailingly simple. Over the year, guests get to try stinging nettle soup, walnut-cashew pizza and plump momos, besides home-baked croissants, cakes and cookies. Which brings us to dessert. A fudgy chocolate cake, bursting with cocoa and good intentions. The little boys who staged the play are wandering around, posing for photographs. Our Indiana-Jones styled scientist seems to be hitting it off with the startlingly cute Germs (who dressed in evil sequins and Bwa Ha Ha-ed through the play). In an unusual twist one of the Germs offers to cut my slice for me, sawing it into mush in his enthusiasm. I’m proudly handed a pile of unsteady crumbs, accompanied by an unwieldy old spoon and a big toothy grin. Best food presentation I’ve seen so far! Returned from from an invigorating holiday in the Himalayas to find my blog smothered with naked sadhus thanks to six-foot-high pestilence Sudhish Kamath. Since I’m now enlightened (hours of silent meditation in Rishikesh, aided by tying and untying your body into yoga knots helps) I understand that this is merely a manifestation of the inmost desires he spends his life desperately trying to hide. I.E. His latent – but insatiable – need to be in the company of scantily clad men. Sudhish, don’t worry – we feel your pain. PS: My camping ground had bathrooms for your information! I even conditioned my hair. So there.